My gorgeous little girl is 3 1/2 years old now. She went through a rough time when we first got her because our older boy bit her in the face the day after she came home to us. She fully recovered and her and Shaddow (he went to doggy heaven in April 2014) were best friends after that. 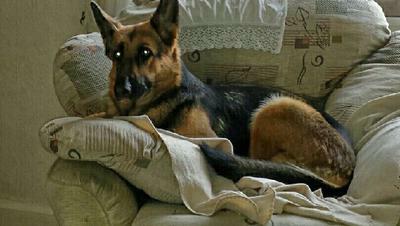 Sheba kept us going and has a full and healthy life. She sleeps on our bed on my feet most nights but she does have her own pillow on the floor too. She loves to play ball in the garden and 'chasing' pigeons that are sat on chimneys! She has her own armchair (she designated it hers! ), but she still likes to lay by my feet, she's done that since being a 9 week old pup. She greets us home from work with such lovely kisses and cuddles, and also likes our neighbour too who opens the back door twice a day for her to go in the garden. She prefers sleeping for the few hours I'm out though! Her and her sister looks so much alike and get on well when our friend brings Sacha round to play. Sheba is a very loving affectionate little girl and I would never let her leave home!! !